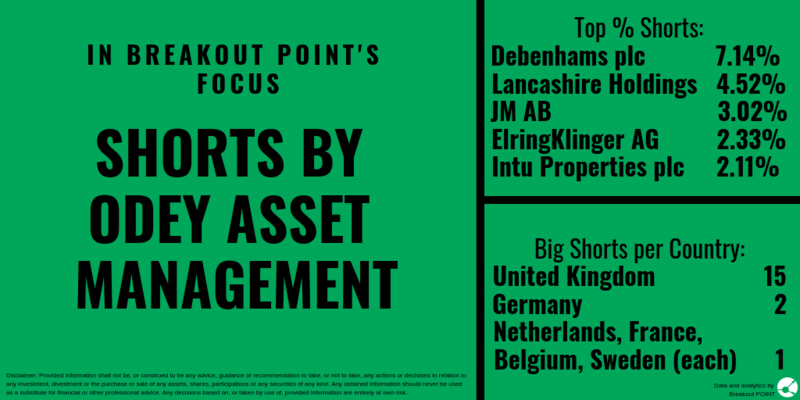 Three out of five top % Odey's shorts are in UK companies: Debenhams plc (7.14%), Lancashire Holdings Ltd (4.52%) and Intu Properties plc (2.11%). Short interest above 4% is rather rare, so Debenhams and Lancashire Holdings shorts are also among top 10 shorts in terms of % held by any individual fund in all of EU countries we track. Our records indicate now (and have indicated in the past) that Odey's fund short selling is strongly focused on UK. Out of 21 currently held short positions above 0.5% ("big shorts"), 15 are targeting companies in UK, 2 in Germany, while remaining 4 big shorts target companies in 4 different EU countries. Industry split of shorts is far more balanced, with the most big shorts in Consumer Discretionary (6), IT (5) and Finance (4). Odey Asset Management is, at least in our records, rather unique when it comes to a holding period of some of the short positions. For example, Intu Properties, Ashmore Group, and Lancashire Holdings shorts have been held by Odey for more than 5 years. 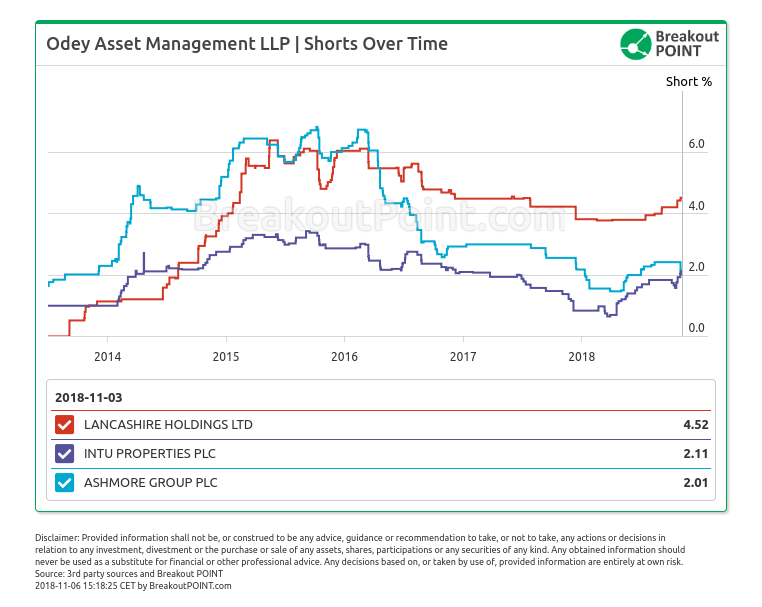 A number of new big shorts by Odey Asset Managment popped up in the past few weeks, among these are: a 0.54% short in DS Smith (mkt cap about £5.21 B), a 0.54% short in Bunzl plc (mkt cap about £7.54 B), a 0.92% short in IQE plc (mkt cap about £0.72 B), a 0.64% short in Melexis N.V. (mkt cap about €2.37 B) and a 0.51% short in Wereldhave N.V. (mkt cap about €1.24 B). 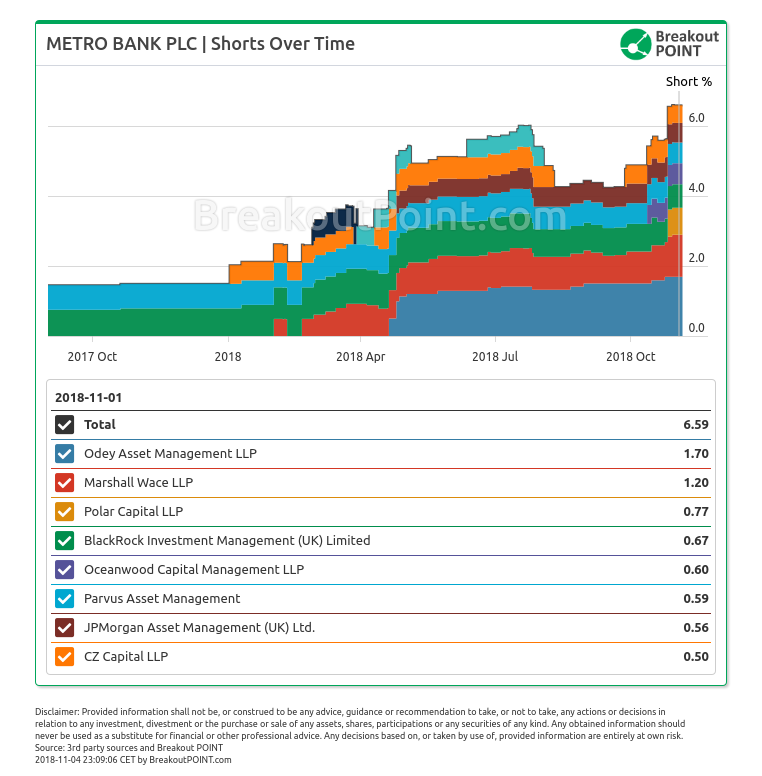 Also, Odey's short stands out among eight big shorts in Metro Bank (mkt cap about £2.2 B). Odey's short position has been publicly disclosed since April 2018 and is currently at 1.7%. The most big shorts in UK are held by: Marshall Wace LLP (46) and GLG Partners LP (44). Such high number of Marshall Wace's short positions is not unexpected. As we noted in our "Who Shorted EU?" post, they have by far the highest number of significant short positions across EU.